Sumatra (Indonesian: Sumatera), is an island in western Indonesia, to the west of the Sunda Islands. It is the largest island that is entirely in Indonesia (two larger islands, Borneo and New Guinea, are shared between Indonesia and other countries) and the sixth largest island in the world at 473,481 km2 with a current population of almost 50 million (53 million administratively, as Riau Islands and Bangka–Belitung Islands are included). Its biggest city is Medan with over 4 million in the greater urban area. Sumatra is an elongated landmass spanning a diagonal northwest-southeast axis. The Indian Ocean borders the west, northwest, and southwest sides of Sumatra with the island chain of Simeulue, Nias and Mentawai bordering the southwestern coast. On the northeast side the narrow Strait of Malacca separates the island from the Malay Peninsula, an extension of Eurasian continent. On the southeast the narrow Sunda Strait separates Sumatra from Java. The northern tip of Sumatra borders the Andaman islands, while on the lower eastern side are the islands of Bangka and Belitung, Karimata Strait and the Java Sea. 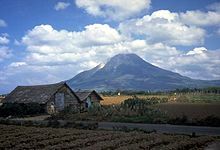 The Bukit Barisan mountains, which contain several active volcanoes, form the backbone of the island, while the northeast sides are outlying lowlands with swamps, mangrove and complex river systems. The equator crosses the island at its center on West Sumatra and Riau provinces. The climate of the island is tropical, hot and humid with lush tropical rain forest originally dominating the landscape. Settler colonies began arriving in Sumatra around 500 BC, and several significant kingdoms flourished there. I Ching, a Chinese Buddhist monk, studied Sanskrit and spent four years of his life working in Palembang. The explorer Marco Polo visited Sumatra in 1292. Eighty-seven percent of Sumatrans are thought to be Muslim. The island is home to 22% of Indonesia’s population.